An April snowstorm is bearing down on portions of Wisconsin. The storm dropped 8 to 10 inches of snow in areas of central Wisconsin Wednesday into Thursday and was forecast to drop a foot or more Thursday night into Friday in northern Wisconsin. The southern part of the state received minor snow followed by rain. The storm arrived just a couple of days after much of the state enjoyed sunny warm weather with temperatures in the 60s and 70s. During that time fire danger levels were elevated and 26 wildfire were reported. The snow and rain has danger levels to low, but as temperature rise again and things dry out, danger levels could rise rapidly. Walleye fisherman are starting to flock to the Peshtigo, Oconto and Menominee rivers. The walleye spawning run on the Winnebago System is well underway. DNR fisheries staff and volunteers tagged around 2,000 adult male and 1,000 adult female walleye on the Wolf River. There were many boats on the lower Fox River this past weekend with a good catch reported by most anglers. There is still ice on some bays of Green Bay but others are opening. Docks were put in this week at Sawyer Harbor launch and Baileys Harbor. Spring runs are continuing on Lake Michigan tributaries with some steelhead and brown trout caught. The Manitowoc River is still high and faster than normal making fishing a struggle. The Branch River is still producing steelhead. The East Twin River was producing a mixed bag of fish at the dam. Anglers were fishing along the Sheboygan River with a few steelhead caught. Fishing efforts on the Milwaukee river have been up over the past week and anglers are having success with steelhead, musky and smallmouth bass. Fishing activity on the Root and Pike rivers has been a lot lighter compared to the past few weeks. Kids 15-years-old and younger can discover the fun of fishing at free Kids' Fishing Clinics on this Saturday at 14 park ponds and lagoons in Milwaukee, Washington and Waukesha counties. Participants receive instruction on equipment and techniques, knot tying, safety and much more, and then can fish afterward. Large flocks of turkeys are beginning to break up and strutting toms have been seen at all hours of the day. Youths across the state will take to the woods this weekend for the youth hunt. Young turkey hunters who are prepared and ready for the cold Saturday opener should have a good chance for success. Some learn to hunts events last weekend had over 50 percent success rates. Woodcock are peenting. Black bears are being seen in many locations. Barred owls have been aggressively trading territorial calls during the early night hours. With ice still on many northern lakes, common loons are stacking up a bit, including a count of 52 at Rice Lake and dozens on southern lakes such as those around Madison. Maple sap is still flowing in the north but is about done in central and southern areas. Red maples are beginning to bud. The aspens are budding also. Spring peepers are calling. The first hepatica, blood root and pasque flowers of the year had begun to emerge in southern Wisconsin before the snow and rain arrived. Another April snowstorm is bearing down on portions of Wisconsin and the upper Midwest. Although such spring snowstorms are common in Wisconsin, the impacts on early avian migrants can be significant if the snow is deep and persists for more than a couple days. Getting snow near you? Here are some of the best ways you can help birds through the adverse conditions. Birders are already reporting large numbers of birds at feeders in areas where 3-12" of snow has fallen so far, including many dark-eyed juncos, sparrows, cardinals, chickadees, blackbirds, robins, woodpeckers, and others. Preceding the storm, last weekend saw the biggest migration event of the season thus far. As a result, sparrows are showing well now with song, fox, savannah, swamp, and the first chipping and white-throated sparrows in the south. Eastern towhees were also reported in good numbers there, as well as a few brown thrashers starting to move in. Purple finches became more prevalent in many areas, while many birders were excited to find their first yellow-rumped warblers of the year. Northern flickers, yellow-bellied sapsuckers, and golden-crowned kinglets were also especially common, with a few ruby-crowned kinglets and eastern phoebes now also. Common loons are stacking up a bit, including a nice count of 52 at Rice Lake, Barron County, and dozens on southern lakes such as those around Madison. Also showing well in some locations were American white pelicans. Thawing wetlands hosted the first American bitterns, Virginia rails, and soras, and the first black-necked stilts have returned to Horicon Marsh. Duck migration continues full tilt wherever open water allows, many wood ducks, hooded mergansers, and Canada geese already getting down the business of egg laying. Most birds migrate at night. 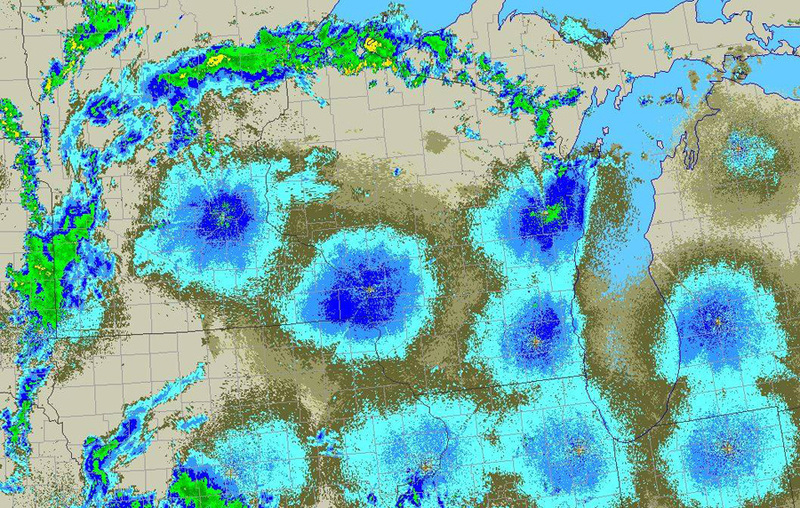 This radar image from 4am on the morning of Sunday, April 7, shows rain to the west and north and northbound birds everywhere else. Photo credit: Graphic courtesy of the National Center for Atmospheric Research. 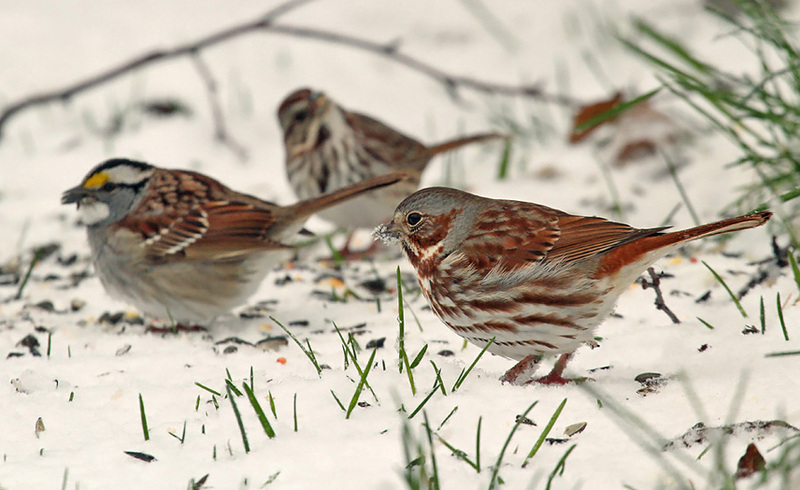 Clear snow to expose bare ground and offer white millet, cracked corn, and sunflower seed for ground-feeding birds like these fox, white-throated, and song sparrows. Photo by Ryan Brady. Most birds migrate at night. This radar image from 4am on the morning of Sunday, April 7, shows rain to the west and north and northbound birds everywhere else. Graphic courtesy of the National Center for Atmospheric Research. Spring is wildfire season and it's important to remember that storm systems bringing snow and rain give a short reprieve in fire danger. While burning debris should always be your last alternative, the safest time to burn leaves, brush and pine needles is when the ground is completely snow-covered and will remain so for the duration of the burn. As things dry out, expect fire danger to increase. There is plenty of dead grass and fallen leaves on the land that makes it easy for a wildfire to start and spread. Stay apprised of fire weather conditions by checking the DNR fire danger webpage each day after 11 a.m.: dnr.wi.gov, keyword "'fire". Mirror Lake State Park is kicking of this year's series of Work*Play*Earth Day Events this Saturday. Come out and help the Friend's group and other volunteers get the park ready for the busy upcoming season. Have a Family Wild Day out at Devil's Lake where family members can play nature-based games, create woodland crafts, light fires, cook over a fire or make dens and shelters. To celebrate National Volunteer Week, the George W. Mead Wildlife Area will be hosting an Open House and Volunteer Social Event with kids' activities, tours, and more. Frog calling has started in earnest in the south and the Southern Kettle Moraine will be holding frog hikes both Saturday and Sunday. Havenwoods State Forest - Family Nature Hike: Snipe Hunt! April 13, 9 a.m.-noon - Bluff Creek Workday: Cutting buckthorn - Come enjoy the spring weather and help volunteers during our monthly Southern Kettle Moraine SNA workdays on the second Saturday. Enjoy a short hike, then help cut and pile brush, learn something, meet knowledgeable people, and enjoy the beauty of this fen area in the process. We will remove buckthorn that can spread and shade out rare fen and savanna plants at this site.